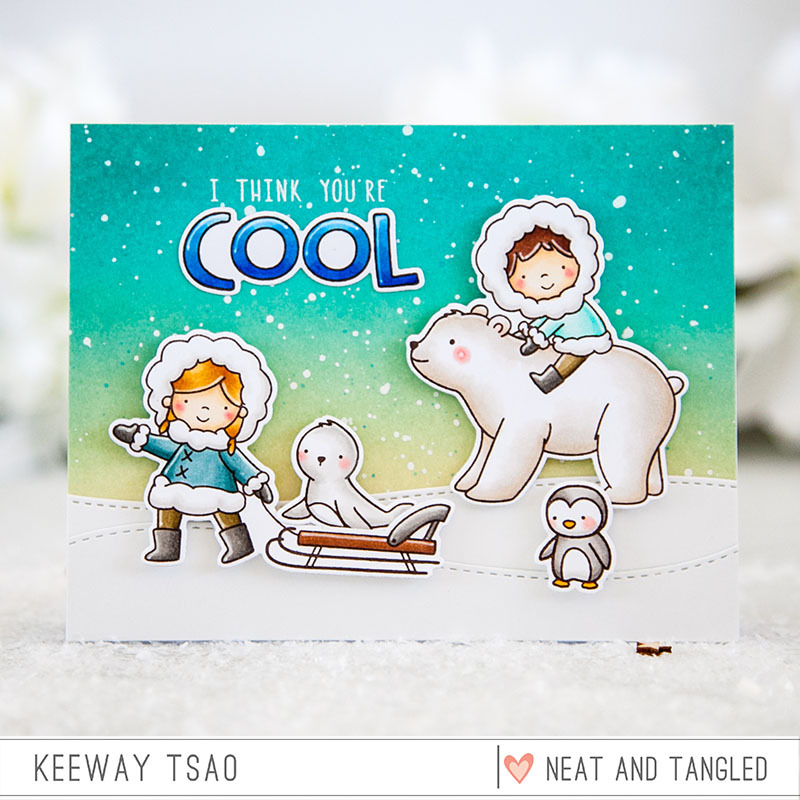 Welcome back to Day 3 of the Neat & Tangled November Release Week! 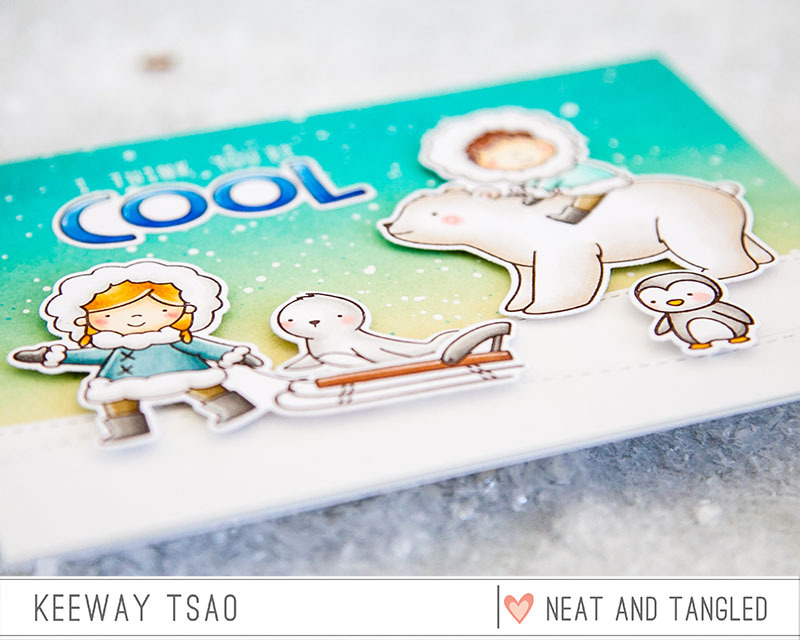 We got a real cool new set to share with you called Stay Cool, illustrated by Elena. Bring on all the cute little eskimos and their arctic friends! There was no doubt in my mind that I needed to make a scene card for these adorable images. I stamped all my images in a dark brown hybrid ink and colored them with copic markers. Keeping it cool, I went with cool tones in my color choices as well. It just made perfect sense! Then, I die cut all my images out with their coordinating dies. I blended an ombre background with Evergreen Bough, Peacock Feathers, and Antique Linen distress oxide inks, and added some white splatter for snow with white acrylic paint. For the ground, I added some stitched snow drift layers created with my Landscape Trio dies out of white card stock. I adhered these layers adjacent to the bottom side of the card. 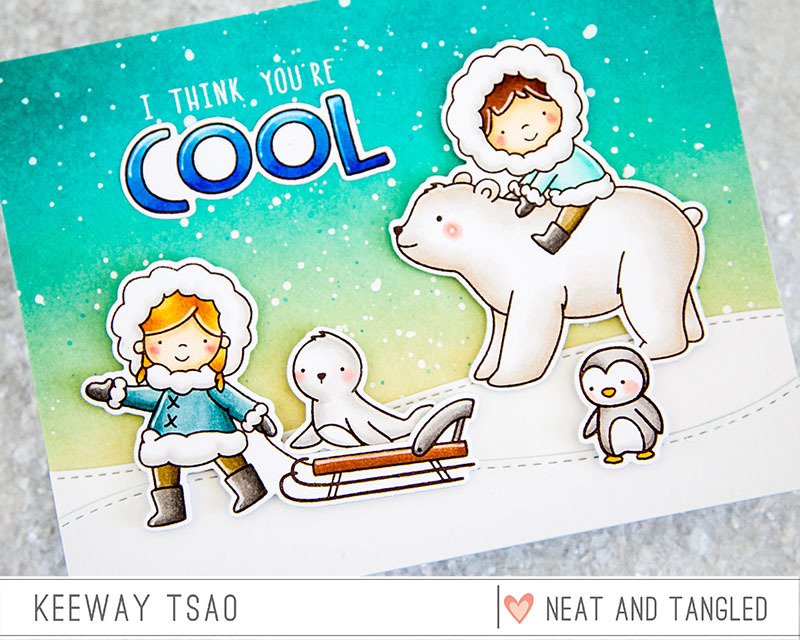 Next, I heat embossed the first part of the sentiment ‘I think, you’re’ in white, and added the colored word ‘COOL’ right below it. And finally I finished up the card by adding all the cute images with foam squares. Gosh, what a darling set! 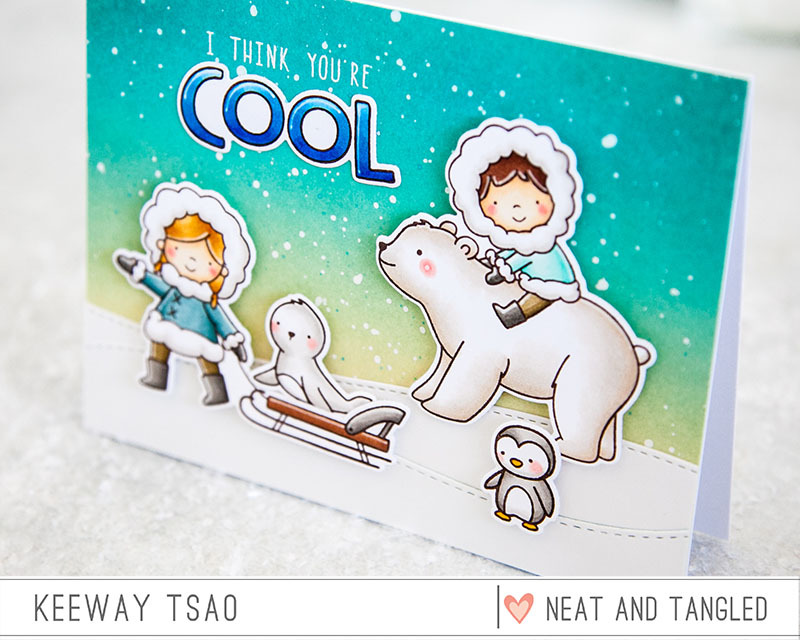 Be sure to stop by the Neat & Tangled blog to see all the release products introduced today, additional inspiration from the team, and also the opportunity to win the daily giveaways throughout release week! I’ll be back tomorrow for our last day of product introductions before the release! 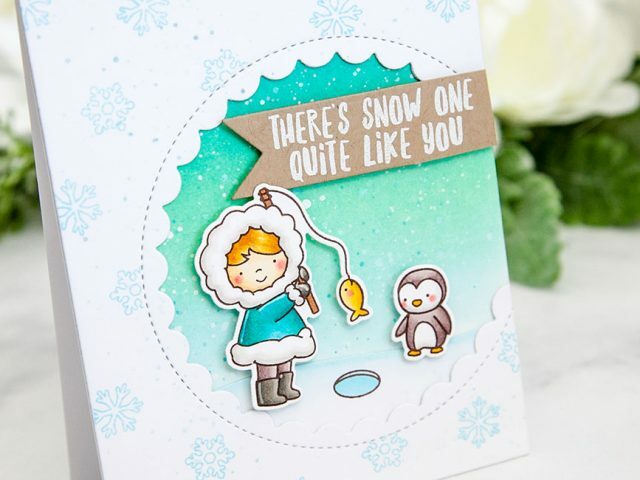 Loving this wonderful and playful winter scene! What a lovely scene!!! Your colouring is amazing!!! Adorable winter scene! Love this cute set and your beautiful coloring! Super cute card. Great scene and coloring. Yes, this is a darling set! And I think your card is pretty cool, too. So pretty and adorable, Love the bear/eskimo image. Your background and coloring are SOOOO AMAZING! I love the vivid colors! Super cute card! I love polar bears! Your scene is so cute and that background….gorgeous! This new stamp set is adorable! Love how you colored them and the fabulous background you created! Your background is really stunning! 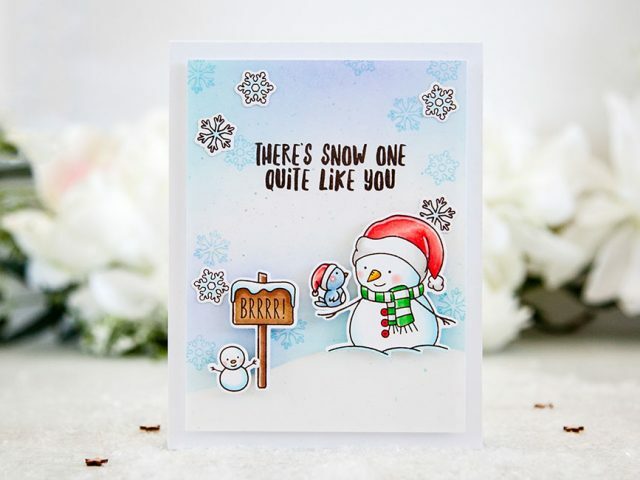 And I love all the fallen snow in your pretty scenic card! Oh, this is adorable!!! I thought the penguin was the cutest, but now that I’ve seen the seal . . . I don’t know; they are both too cute! LOVE your gorgeous background and your fabulous coloring! 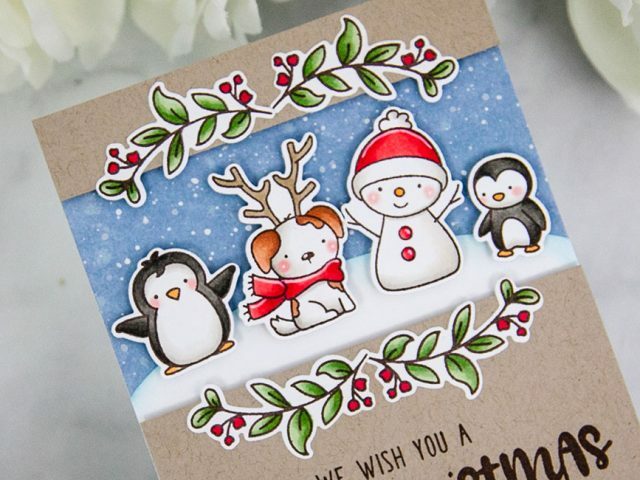 Love the background for this cute and cool scene with critters and kids. Sweet and beautiful card! You created such a lovely scene. Gorgeous coloring and blended background. Fabulous card! I love the color scheme. Awesome! 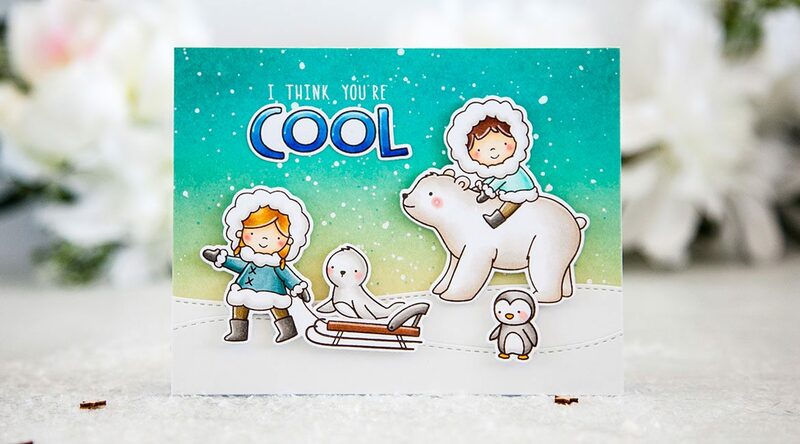 Beautiful card with beautiful colouring and a fabulous background!